The Subboreal is a climatic period, immediately before the present one, of the Holocene. It lasted from 3710 to 450 BCE. The composite scientific term Subboreal, meaning "below the Boreal," is derived from the Latin sub (below, under) and the Greek Βορέας, from Boreas, the god of the North Wind. The word was first introduced in 1889 by Rutger Sernander to distinguish it from Axel Blytt's Boreal, which had been established in 1876. The Subboreal followed the Atlantic and was followed by the Subatlantic. The Subboreal is equivalent to W. H. Zagwijn's pollen zones IVa and IVb and T. Litt's pollen zone VIII. In the pollen scheme of Fritz Theodor Overbeck, it occupies pollen zone X. In paleoclimatology, it is divided into an Older Subboreal and a Younger Subboreal. Historically, the Subboreal is equivalent to most of the Neolithic and the entire Bronze Age, which started 4200 to 3800 years ago. The Subboreal is usually defined as 3710 to 5660 years BP. The lower limit is flexible, as some authors prefer to use 4400 BCE, or 6350 BP in northwestern Poland, even 4830 BC, or 6780 BP, And others use 5000 calendar years, or 3050 BCE. The upper limit of the Subboreal and, therefore the beginning of the Subatlantic, is also flexible and can be attributed to 1170 to 830 BCE, but it is usually fixed at 450 BCE. In varve years, the Subboreal corrsponds to 5660 to 2750 years BP. The boundary between the older and the younger Subboreal is considered to be 1350 BCE. The climate was generally dryer and slightly cooler (by about 0.1 °C) than in the preceding Atlantic but still warmer than today. The temperatures were 0.7 °C higher than during the following Subatlantic. Consequently, in Scandinavia the lower limit of glaciers was 100 to 200 m higher than during the Subatlantic. On the whole, the oscillating temperatures slightly receded in the course of the Subboreal by about 0.3 °C. In the Aegean, the beginning of the Subboreal was marked by a pronounced drought, centered around 5600 years BP. Of far greater importance as the coming to an end of the African Humid Period, reflected in the lakes of subtropical Africa (like Lake Chad) experiencing a rapid fall in their water levels. During the interval 6200 to 5000 years BP, drier conditions were in southern Mesopotamia, causing great demographic changes and probably instigating the end of Uruk. In Germany, a drastic climatic cooling can be observed around 5000 varve years BP in the maars of the Eifel. In the preceding interval lasting from 8200 till 5000 varve years (Holocene Climatic Optimum), the July temperatures were on average still 1 °C higher. At the same time, the January temperatures were rising and the yearly precipitation increased. In Northern Africa and in the Near East, the interval from 4700 to 4100 years BP had renewed and lasting dry conditions, as is indicated by lake level minima. Between 4500 and 4100 years BP, monsoonal precipitations weakened, a possible cause for the upheavals that led to the end of the Old Kingdom of Egypt. The Levant shows a similar climatic evolution. The dry conditions prevailing in Mesopotamia around 4200 years BP probably resulted in the downfall of the Akkadian Empire. Levels of carbon dioxide had reached beginning of the Subboreal its Holocene minimal value of 260 ppm. During the Subboreal, it started rising and reached 293 ppm at the end of the period. As a comparison, today's value is over 400 ppm. In Scandinavia, the Atlantic/Subboreal boundary shows a distinct vegetational change. That is less pronounced in Western Europe, but its typical mixed oak forest shows quite a fast decline in elm and linden. The decline in linden is not fully understood; it might be due to cooling or human interference. The decline in elm is most likely due to elm disease, caused by the ascomycete Ceratocystis ulmi, but climatic changes and anthropogenic pressure on the forests certainly must be considered as well. The decline in elm, with a recession from 20 to 4%, as observed in Eifel maar pollen, has been dated in Central and Northern Europe as 4000 years BC, but it more likely was diachronous over the interval 4350 to 3780 BC. Another important event was the immigration of European beech (Fagus sylvatica) and hornbeam (Carpinus betulus) from their retreats on the Balkan and south of the Apennines. This happened also diachronously: beech pollen are found for the first time in the interval 4340 to 3540 BC, hornbeam pollen somewhat later between 3400 and 2900 BC. With the start of the Younger Subboreal is the massive spreading of beech. 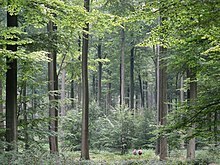 The establishment of beech and hornbeam was accompanied by indicator plants for human settlements and agriculture like cereals and plantain (Plantago lanceolata), and hazel was receding. The relatively-dry climate during the subboreal furthered the spreading of heath plants (Ericaceae). Like in the Atlantic, the global sea level kept on rising during the Subboreal but at a much slower rate. The increase amounted to about 1 m, which corresponds to a rate of 0.3 mm per year. At the end of the Subboreal, the sea level was about 1 m below the current value. In the Baltic the Litorina Sea had already established itself before the onset of the Subboreal. During the Older Subboreal the second Litorina transgression raised the sea level to 1 m below the actual value. After an intermediate Post-litorine Regression the third Litorina transgression reached 60 cm below present and during the beginning Subatlantic, it reached today's value. In the North Sea region, the Flandrian transgression of the Atlantic was followed by a slight regression or standstill at the beginning of the Subboreal. ^ Sernander, R. (1889). Om växtlämningar i Skandinaviens marina bildningar. Bot. Not. 1889, p. 190-199, Lund. ^ BIytt, A. (1876a). Immigration of the Norwegian Flora. Alb. Cammermeyer. Christiania (Oslo), p. 89. ^ Waldo Heliodoor Zagwijn (1986). Nederland in het Holoceen. Geologie van Nederland, Deel 1, p. 46. Rijks Geologische Dienst Haarlem (editors). Staatsuitgeverij, 's-Gravenhage. ^ Litt, T.; Brauer, A.; Goslar, T.; Merkt, J.; Bałaga, K.; Müller, H.; Ralska-Jasiewiczowa, M.; Stebich, M.; Negendank, J. F. W. (2001). "Correlation and synchronisation of Lateglacial continental sequences in northern central Europe based on annually laminated lacustrine sediments". Quaternary Science Reviews. 20 (11): 1233–1249. Bibcode:2001QSRv...20.1233L. doi:10.1016/S0277-3791(00)00149-9. ^ Herking, C. M. (2004). Pollenanalytische Untersuchungen zur holozänen Vegetationsgeschichte entlang des östlichen unteren Odertals und südlichen unteren Wartatals in Nordwestpolen. Dissertation, Göttingen, Georg-August-Universität. ^ Tobolski, K. (1990). "Paläoökologische Untersuchungen des Siedlungsgebietes im Lednica Landschaftspark (Nordwestpolen)". Offa. 47: 109–131. doi:10.1594/PANGAEA.739770. ^ Jahns, S. (2000). "Late-glacial and Holocene woodland dynamics and land-use history of the Lower Oder valley, north-eastern Germany, based on two, AMS14C-dated, pollen profiles". Vegetation History and Archaeobotany. 9 (2): 111–123. doi:10.1007/BF01300061. ^ a b Litt, T.; Schölzel, C.; Kühl, N.; Brauer, A. (2009). "Vegetation and climate history in the Westeifel Volcanic Field (Germany) during the past 11 000 years based on annually laminated lacustrine maar sediments". Boreas. 38 (4): 679–690. doi:10.1111/j.1502-3885.2009.00096.x. ^ Dahl, S. O.; Nesje, A. (1996). "A new approach to calculating Holocene winter precipitation by combining glacier equilibrium-line altitudes and pine-tree limits: a case stud from Hardangerjokulen, central southern Norway". The Holocene. 6 (4): 381–398. doi:10.1177/095968369600600401. ^ Kotthoff, U.; Muller, U. C.; Pross, J.; Schmiedl, G.; Lawson, I. T.; van de Schootbrugge, B.; Schulz, H. (2008). "Lateglacial and Holocene vegetation dynamics in the Aegean region: an integrated view based on pollen data from marine and terrestrial archives". The Holocene. 18 (7): 1019–1032. doi:10.1177/0959683608095573. ^ deMenocal, P.; Ortiz, J.; Guilderson, T.; Adkins, J.; Sarnthein, M.; Baker, L.; Yarusinsky, M. (2000). "Abrupt onset and termination of the African Humid Period:". Quaternary Science Reviews. 19 (1–5): 347–361. Bibcode:2000QSRv...19..347D. doi:10.1016/S0277-3791(99)00081-5. ^ Kennett, D. J.; Kennett, J. P. (2006). "Early State Formation in Southern Mesopotamia: Sea Levels, Shorelines, and Climate Change". The Journal of Island and Coastal Archaeology. 1 (1): 67–99. doi:10.1080/15564890600586283. ^ Gasse, F.; Van Campo, E. (1994). "Abrupt post-glacial climate events in West Asia and North Africa monsoon domains". Earth and Planetary Science Letters. 126 (4): 435–456. Bibcode:1994E&PSL.126..435G. doi:10.1016/0012-821X(94)90123-6. ^ Gasse, F. (2000). "Hydrological changes in the African tropics since the Last Glacial Maximum". Quaternary Science Reviews. 19 (1–5): 189–211. Bibcode:2000QSRv...19..189G. doi:10.1016/S0277-3791(99)00061-X. ^ Enzel, Y.; Bookman (Ken Tor), R.; Sharon, D.; Gvirtzman, H.; Dayan, U.; Ziv, B.; Stein, M. (2003). "Late Holocene climates of the Near East deduced from Dead Sea level variations and modern regional winter rainfall". Quaternary Research. 60 (3): 263–273. Bibcode:2003QuRes..60..263E. doi:10.1016/j.yqres.2003.07.011. ^ Weiss, H.; Courty, M.-A. ; Wetterstrom, W.; Guichard, F.; Senior, L.; Meadow, R.; Curnow, A. (1993). "The Genesis and Collapse of Third Millennium North Mesopotamian Civilization". Science. 261 (5124): 995–1004. Bibcode:1993Sci...261..995W. doi:10.1126/science.261.5124.995. PMID 17739617. ^ Parrenin, F., Loulergue, L. & Wolff, E. (2007). EPICA Dome C Ice Core Timescales. World Data Center for Paleoclimatology Data Contribution Series # 2007-083.NOAA/NCDC Paleoclimatology Program. Boulder CO, USA. ^ Betts, R. A.; Jones, C. D.; Knight, J. R.; Keeling, R. F.; Kennedy, J. J. (2016). "El Niño and a record CO2 rise". Nature Climate Change. 6 (9): 806–810. Bibcode:2016NatCC...6..806B. doi:10.1038/nclimate3063. ^ Peglar, S. M.; Birks, H. J. B. (1993). "The mid-Holocene Ulmus fall at Diss Mere, South-East England – disease and human impact?". Vegetation History and Archaeobotany. 2 (2): 61–68. doi:10.1007/BF00202183. ^ Behre, K.-E. & Kucan, D. (1994). Die Geschichte der Kulturlandschaft und des Ackerbaus in der Siedlungskammer Flögeln, Niedersachsen. Probleme der Küstenforschung im südlichen Nordseegebiet, 21, p. 1-227. ^ Kubitz, B. (2000). Die holozäne Vegetations- und Siedlungsgeschichte in der Westeifel am Beispiel eines hochauflösenden Pollendiagrammes aus dem Meerfelder Maar. Dissertationes Botanicae, 339, p. 106.